Plain and Simple’s roving reporter/man about town and clubbing addict Jammy brings you his eye view of the event he was partying at in the last week… This time he spent his jaunt at Be@TV presents Rhythmatic and Fabric with Marcel Dettmann, O/V/R and Levon Vincent. Hello and welcome to Jammy’s Jaunts! Your weekly clubbing review of London! The last jaunt included the midweek Be@TV Rhythmatic special and Fabric with Marcel Dettmann on Saturday. Starting off proceedings on Thursday was the very special Be@TV live broadcast at Bedroom Bar in Shoreditch with residents Ceri, Archie Hamilton and Stathis Lazarides all playing. The event started at 7pm and I got there a little while after and managed to catch the last track from good friend Ceri, which I was gutted about, but it’s all good. I’ve never been to Bedroom Bar either so it was quite cool and recently has been refurbished and does look quite nice now. It’s quite small but cosy at the same time and nice and intimate for a Be@TV broadcast. So as Ceri finished her set, Archie Hamilton (Director of A&R at Moscow Records) came on. It’s always nice to see the Rhythmatic crew play and even more special as it was for Be@TV at Bedroom Bar. Archie played some really cool tech house which got quite deep in places which was just right for the time and place and he kept the vibe and the groove going which was good to hear. 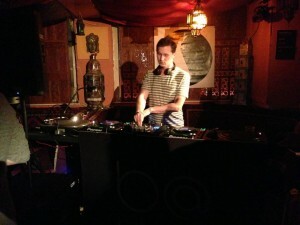 Definitely a DJ to look out for, especially in and around London and at the Rhythmatic parties. 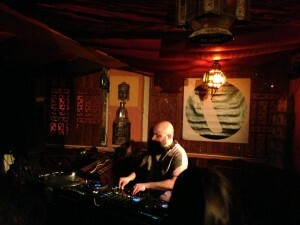 Next up was the next Rhythmatic resident: Stathis Lazarides. He was last to come on and certainly continued the wicked groove Archie had created. It was really nice and smooth tech house on a decent system that Be@TV had special brought in for this venue. The beats were rolling and there were some really groovy tracks being played. Definitely a DJ to look out for, if you have never seen him play and always nice to recognise talent, wherever you see it and from whatever genre of music you listen to. Rhythmatic usually do monthly parties and the next one if you are interested is on 13th April with Mateo and Josef, Ceri (resident), Archie Hamilton (resident) and headliners Lilith and Priku. Check it out! So anyway back to the music and the jaunt, the people in the place loved the tracks and at end they were treated with a very special hour at the end with Stathis and Archie going back to back! I managed to catch a bit of their double act but unfortunately had to leave as it was a school night and had to get home. Nonetheless it was a pretty cool evening and nice to break up the week with a midweek jaunt to get the weekend warmed up! Good times! Next on the jaunt radar was the very special Fabric with special guests in Room 2: O/V/R (James Ruskin and Regis) and Berghain resident Marcel Dettmann and Levon Vincent in Room 1 while One Records took over Room 3. Standard procedure followed and I got there around midnight and caught resident Terry Francis warming things up from 23:00 – 02:00. 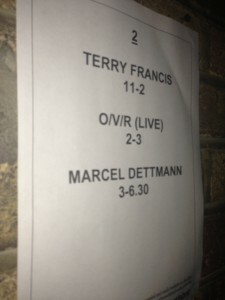 O/V/R played a live set from 02:00 – 03:00 and to close Marcel Dettmann from 03:00 – 06:30. A brilliant night for complete no nonsense techno! Terry Francis played an amazing warmup and one of the best warm up’s I have heard/seen have come from this man, such a massive talent and legend, whenever he is playing, wherever the venue, warming up, middle set or closing. By the time he had finished, Room 2 was perfectly warmed up for O/V/R and their live set. The last time I caught them was at Fabric last year and I can recall that being a great jaunt! I know I have said it loads of times before, but we are so lucky week in, week out to have quality techno in London. The sheer amount of nights every weekend is incredible. It’s sometimes so hard to pick the night you want to go to, as there is an equally good night on. But if you know your music and the genre that you are into, the majority of the time, you won’t be disappointed. There are however the odd number of nights, which are not really desirable and you can stay away from them if you know the decent and quality parties. So anyway slightly went off a tangent there, but back to the music. Dettmann came on at 3am after an amazing live set from O/V/R and Dettmann really was exceptional. Every time I have seen him play in Room 2, he has been extraordinary. From start to finish he built up such a warm, rich techno sound and continued to batter the impressive room 2 soundsystem with everything that he had. A true techno master class from one of the best in the business. The crowd was really friendly and cool in my opinion and the room wasn’t packed. It was comfortable and you had plenty of room to dance which is always good. He carried on playing past 6:30am until about 7:15am if I remember correctly and it was a thoroughly enjoyable jaunt in Fabric. Dettmann always delivers the techno right where it’s needed. A huge and massive talent. So anyway as room 2 shut, Levon Vincent was still powering through in Room 1 and I have always been a big fan of his music and managed to catch a good hour of him. The tracks he was dropping were very dark and hypnotic. You could say very twisted in a way. The room was still rammed and everyone was enjoying the groove. A very cool DJ to catch if you have never seen him play and he has recently released the Fabric 63 mix which is a recommended mix from me that you should listen to! What a great jaunt and a great weekend! Same time, next weekend?